A lot of you have not yet come over to follow my blog on it’s new home. It’s easy even if you don’t have a Blogger or BlogSpot account… updates can be sent to your email! Come one, come all. The new blog is in full swing. Today? Smorgasbord Breakfast Biscuits — Filling and delicious. YUM! After toying with the idea for the past couple of weeks, I’ve decided to switch over to Blog Spot. Please be a doll and subscribe to the new blog so you don’t miss out on the great things to come! 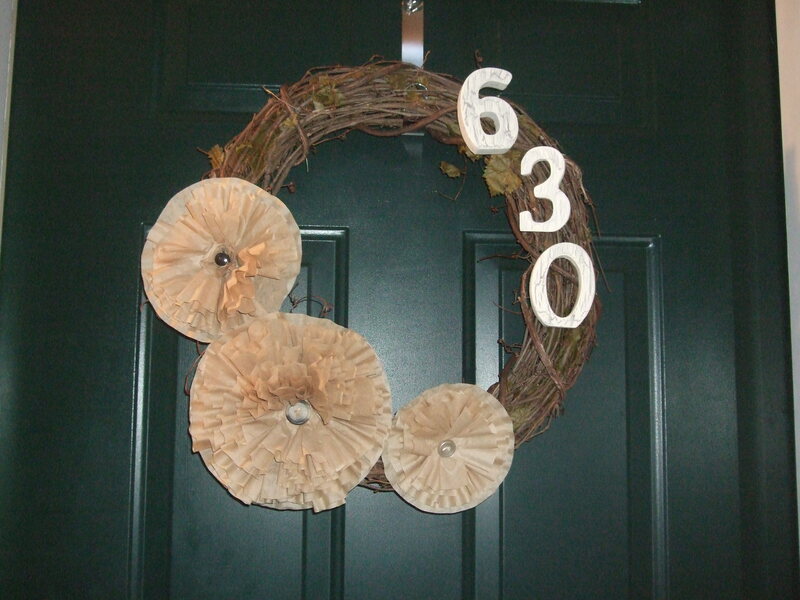 I have wanted a great wreath on our door since taking down all of the holiday stuff. After searching high and low and everywhere in between, I wasn’t able to find one that oozed charm and simplicity so I settled on decided to make my own. I knew what I didn’t want it to look like, but I couldn’t picture what I DID want. For inspiration, I turned to Pinterest (where else?!) and found so many adorable coffee filter wreathes. 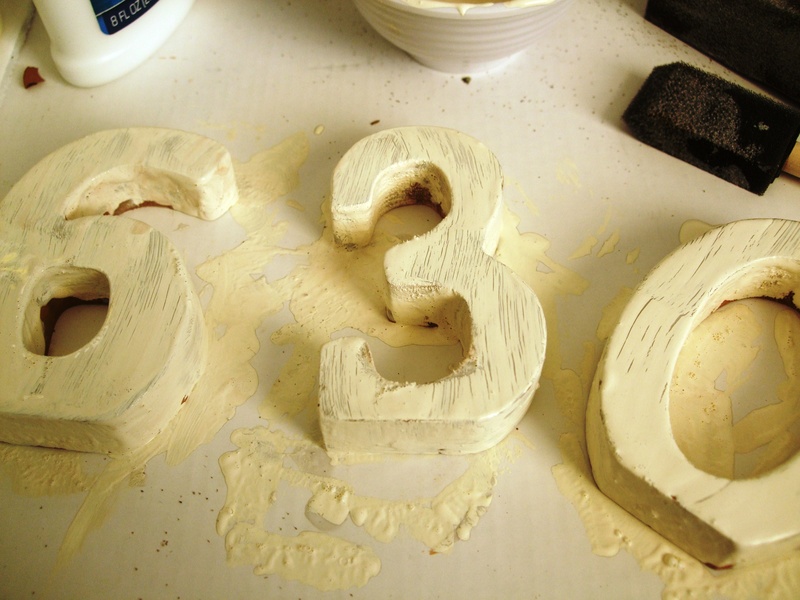 Oh the things you can do with common household supplies… I love it!! While I thought a full frilly wreath might be too much for the Mr. to handle, when I saw this, I knew I was on to something. 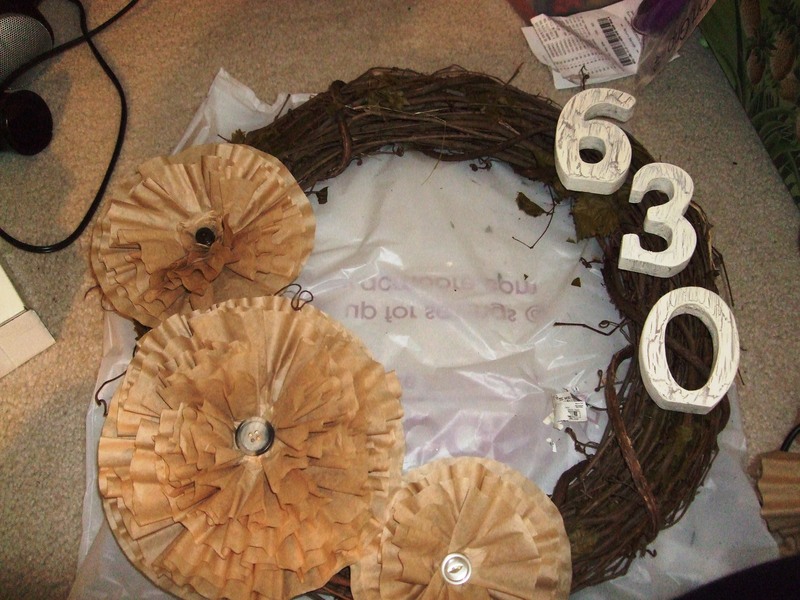 Off to AC Moore I went for a grapevine wreath and house numbers. With minimal supplies and just an hour of time the wreath was done. Not too shabby… rather, it’s just shabby enough!! Since the numbers are what took the most time because of the crackle finish, I thought I would actually highlight that aspect rather than the flowers since there are tutorials all over the web for those. I wanted something that looked found but I didn’t have time to browse antique stores for a 6, 3, and 0. Crackle is all over everything – outdoor décor, picture frames, even finger nails, so it was easy to decide upon that finish. I ran across some crackle medium at the craft store for $8 which on its own was not that bad but since all I wanted to paint was three 4” letters, that just didn’t seem cost effective. 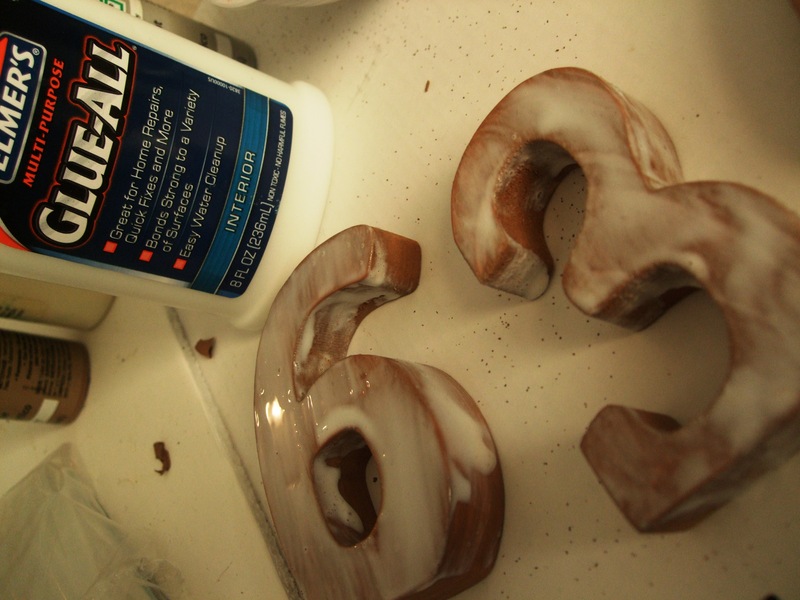 I did some searching and found that you can do crackle with Elmer’s glue… SAY WHAT?! Yes, you read that right. 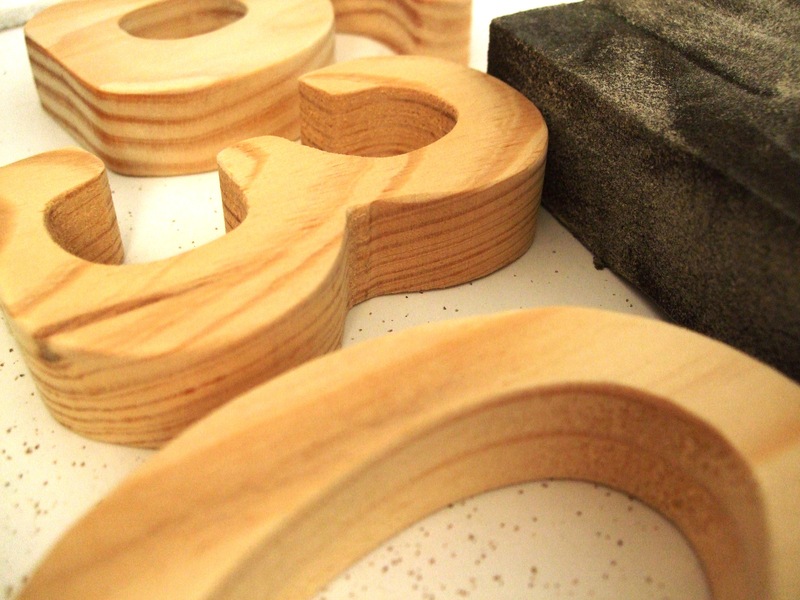 Elmer’s glue will create a phenomenal crackle finish! 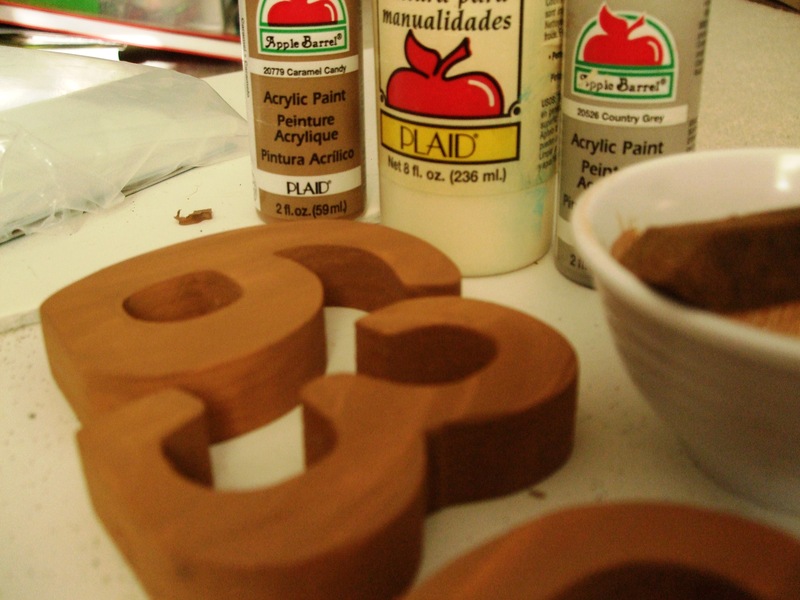 Paint a thick, gloppy (gloppy is a word J) coat of glue. Allow it to get tacky and thicken up a bit but do NOT let it dry. 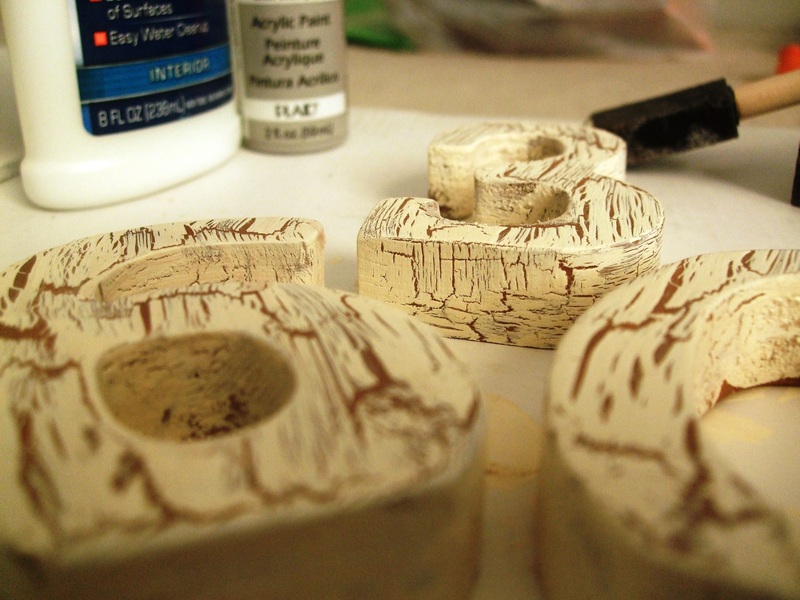 Immediately paint the main color; this is the color that will eventually crackle. Try to paint in one direction, which I personally found to be a bit difficult considering I was making a 3-dimensional object, but do your best! Enjoy the crackly goodness and use for whatever finished project you want! Since Elmer’s is not waterproof, you NEED to waterproof it with a clear coat, but that’s not necessary if it won’t come in contact with water. If it’s even possible, my sickness has spread to my ear… Guess I will try to make an another appointment on Monday to start getting back to normal. Now, on to better and happier things. I mentioned in this post that I wanted to learn embroidery and I have already taken some steps and learned a few stitches! It’s definitely one of the crafts that are easy to learn — just hard to master (at least for me). Even after my very limited exposure, I LOVE EMBROIDERY!! 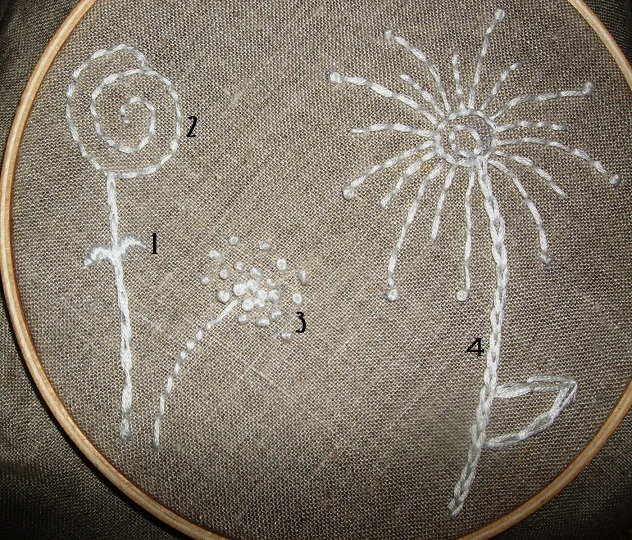 I think the best way I can come up with to describe it is doodling with thread. Like drawing and coloring, it’s really a limitless medium. I’m hooked and so happy I decided to learn. If you’re looking for a new crafty hobby, I suggest you try it because it’s relatively inexpensive ($2/hoop, $3/fabric, $.35/embroidery floss, and $2/embroidery needles) so if it doesn’t reel you in, you won’t be out much cash in the long wrong. Once you have everything you need, you’ll have to learn how to do it. There are great resources out there to learn the stitches and to gather creative inspiration. Sarah’s Hand Embroidery has been my stitch bible because the tutorials are so easy to use and there are examples for each and every stitch that you can imagine. I also used YouTube and found some great videos that demonstrated how to split the thread which was something I didn’t even know I was supposed to do. Now that I know the basics (and you can, too! ), it’s time to get some ideas on what to do with that knowledge. Two books that I want to check out are Sublime Stitching and Doodle Stitching. Pinterest is also great because you can see what other people are doing and also gather free patterns. I was considering doing a tutorial, but I’m not good enough yet so I suggest you check out Sarah’s directions because they are fool-proof. Here’s to hoping that you like embroidery just as much as I do! You can now call me Germy McSickerson. Strep Throat and Bronchitis are dominating my life right now. Besides work (somehow I haven’t missed a day! ), my free-time has consisted solely of laying in bed and snuggling with my kitty on the couch. It’s been so bad that the Mr. had to learn how to do the laundry.. That didn’t even sound like I was upset did it? haha. Surprisingly, I have done a few projects with some of the extra time from the long weekend. I’m a baby, though –a hideously flush, runny-nosed, red-eyed baby– and haven’t updated my blog so I thought I better keep myself on track.